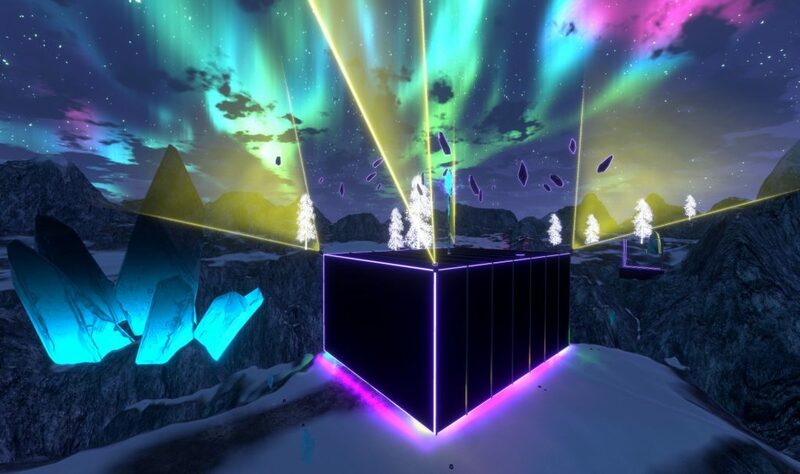 Explore Crystalline Summit in the biggest update to Soundscape VR yet! Crystalline Summit is not just a new Soundscape venue, but a new Soundscape world full of secrets waiting to be found. Explore and discover, draw and create, relax and watch – all are equally amazing experiences. Turn on your favorite music from any source or service on your PC, boot up Soundscape, and slip into another dimension where you create your own visually stunning experience. There are no beatmaps that need to be painstakingly made and modded here, Soundscape handles that all automatically! You just play your favorite songs and enjoy, it’s that easy! In addition, there are countless changes improving the core gameplay, new player experience, music reactivity, controls, visual effects, and so many more additions like dozens of new psychedelic audio-reactive effects you can use to paint effects through the air around you or alongside you as you soar through the sky. Try to keep your jaw off the floor as you watch the geometric shapes you are drawing out of your motion controllers warp and morph around you as they unwind and react to your favorite music. Last but not least, this update is of course 100% FREE, made for music lovers by music lovers! We are proud to create the most mesmerizing and creative free VR experiences in the world, and hope you love our new work as much as everyone else has! If you are as passionate about music as we are, visit our Discord to say hello and chat with the team about your favorite new releases! Thanks for playing and feel free to stop by and say hello at our Burning Man Art Installation this year if you’re going to be there!